CorpNet vs LegalZoom Which Is Right For You? If you’ve spent time researching the online incorporation service or filing industry, you’ve probably run into the same issue: telling the difference between companies like CorpNet and LegalZoom. After reading customer reviews and checking out websites, packages and service offers can start blending together. 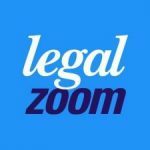 It’s for this reason we bring you this CorpNet vs. LegalZoom Comparison review. We’ll be putting these two companies against each other and breaking down their packages so you can see who really comes out on top. We’ll walk look through their commonalities first, then take you through an in-depth look of their differences, in price, options and packages. It’s a lot to cover, so without further adieu, let’s get started! 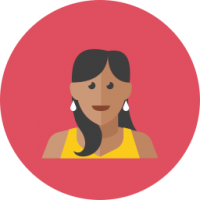 Looking first at what they’ve got in common, there’s a number of valuable features on both platforms to help you incorporate your business. 1) A+ Ratings through the Better Business Bureau. However, this gets a little complex when you look closely at the companies, but we’ll get into that in the Differences section below. 2) Both help you set up and file all the necessary paperwork and components to establish an appropriate legal structure for your business. 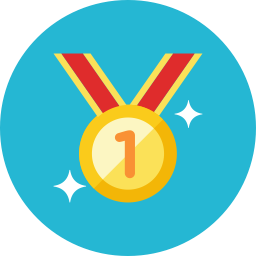 3) Both companies have 100% satisfaction and money back guarantees, which really sets them apart from the brunt of their competition. 4) They’ll both continue to help as compliance experts as long as you need them. Both offer far more than just forming and filing for new LLC’s and Corporations including things like trademarks and business filings. 5) The customer support for both is highly-accessible with multiple contact options including phone and email. 6) Free Perks! For example free trademark or business name searches at no additional cost. 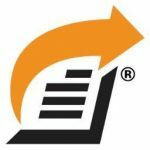 These can cost you anywhere from $25-50 with other online filing and formation companies. When we really break it down, there’s quite a few distinctive differences to consider when you’re deciding which company is the best fit. 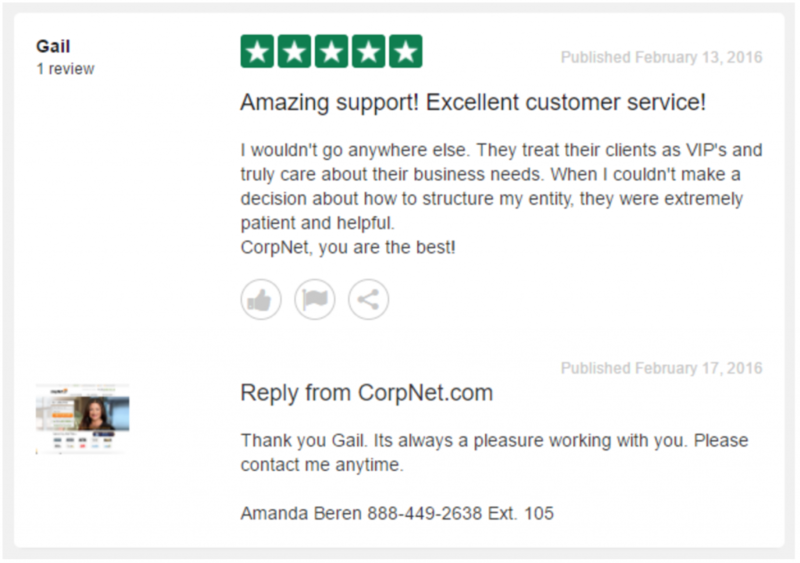 CorpNet is a great choice if you’re looking for the most bang for your buck. They offer tons of free & discounted services including a free Registered Service Agent during your first year, free business consultations, access to their platform and tools as a non-member, automatic rush-preparation of your documents and even an additional 10% discount. On the other side of the coin, LegalZoom is more suited for those needing lots of hand-holding and access to a legal professional. They’ll hook you up with an affordable attorney, and you’ll always have access to their extensive learning center. They’re a much larger operation. During our research, we look pretty closely at what customers are saying about their experience with these providers in reviews and testimonials. Looking at the reviews alone, it really depends on what sources you find. For example, CorpNet has over 290 reviews on TrustPilot, of which 95% are 5-stars. In comparison, LegalZoom only has 14 reviews on TrustPilot. 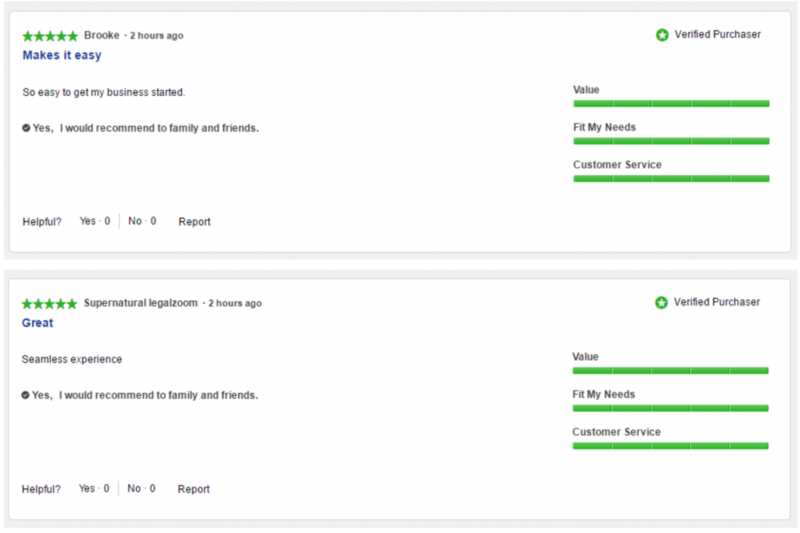 To give you a quick look, we’ve grabbed a couple recent reviews off TrustPilot so you can see for yourself. But before you make a snap decision based on one website’s reviews, it’s important to realize it’s just one source. 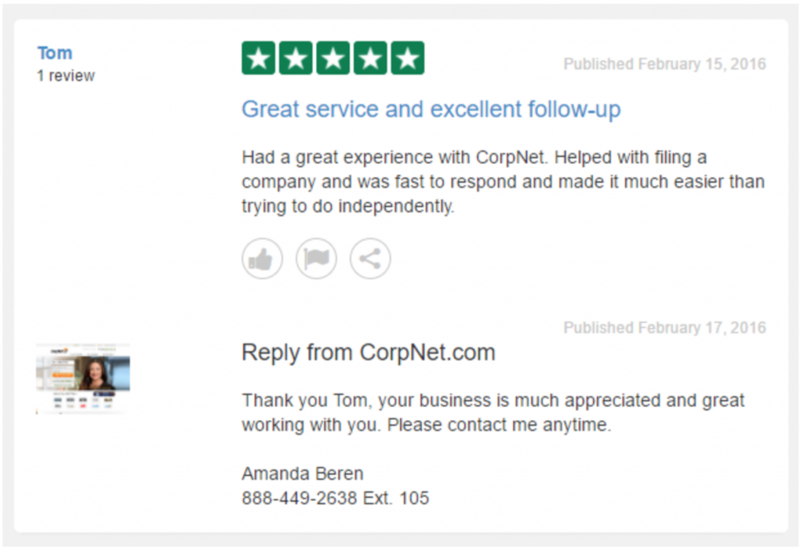 CorpNet has a huge presence of TrustPilot, while most of LegalZoom’s reviews are housed on their own site. In fact, LegalZoom currently sports over 10,000 positive reviews on their site which they’ve gathered since opening their doors in 1999. It’s for this reason specifically that we recommend you check out a few different sources and take reviews with a grain of salt. 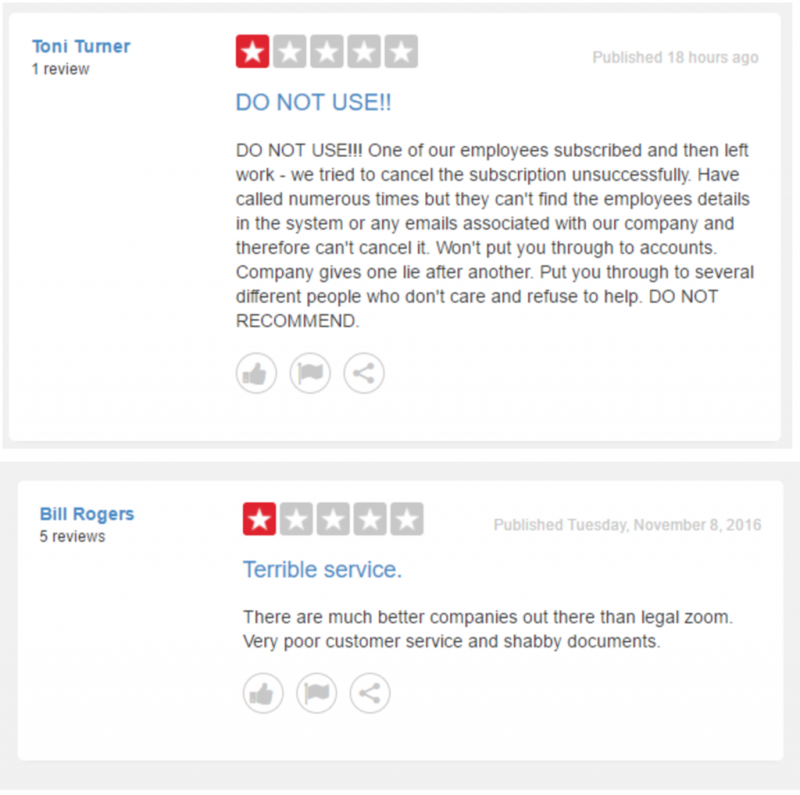 To Illustrate this point, we’ve also included a couple reviews from LegalZoom’s website as well. As you can see, it really depends on where you’re looking, which is why we encourage you to check out a few different review sites and sources before making a decision. At the end of the day though...CorpNet comes out on top in terms of reviews because while the VAST majority of theirs are sparkling, LegalZoom is more of a mixed-bag with some good, some not so good (surrounding customer service and payment processing issues). Both companies offer three packages with differing degrees of involvement and distinctive pricing variations. We’ve drawn up a handy infographic to show you the basics of each and compare their pricing in relation to services offered so you can see exactly what you’re getting with each package. It’s important to note that with both of these companies, their packages build on one another. So everything that’s included in the first package will be included in the second and third packages, on top of all the extra goodies. Right off the bat, you can see that CorpNet’s Basic pricing is the same as LegalZoom’s. For $79 you’ll be getting pretty close to an identical service, minus corporate bylaws and LegalZoom’s $50,000 Peace of Mind Guarantee. Their base package is a great option for those of you who are on a really strict budget. As you get into the most extensive packages, the two differ greatly in terms of value and price. For example an operating agreement and EIN registration service is included in CorpNet’s Complete package for $249, getting these through LegalZoom now costs an additional $159 on top of the package cost, for example with. Once we start looking into the bigger packages, the pricing starts to even out between these two. Both companies have essentially the same services offered. The differences come from which package they end up in and how much they cost. For example, if you’re really set on receiving a Corporate Kit & Seal, you’ll actually end up paying $10 less with LegalZoom. This is because LegalZoom offers this feature in their second package, while CorpNet features the same service in their third package. We recommend LegalZoom for those of you that want the whole enchilada, so to speak. If all the additional features appeal to you, and your comfortable spending a bit more on a larger set of services, they’re a great option. At the end of the day, both companies are reliable in our book. You’ll be in very good hands, working with professionals who have years of experience in the industry. But with that being said, from a merely financial standpoint, you’re getting an impressive bargain from CorpNet for premium features like an Operating agreement and obtaining an EIN. So, if you’re interested in saving some money, or simply want more information on their platform, click the link below. Cheers!